Dr. Darnell offers many services and procedures to meet your dental needs. Depending on your situation, we will work with you to determine the best treatment plan and procedures for your teeth and your budget. Here is a list of a few of the procedures that we offer. If you have any questions or would like to set up an appointment, please contact us today. Preventive dentistry is a crucial supplement to your daily hygiene routine. You can prolong the health and natural look of your smile by taking advantage of our great preventive dentistry services. We can help to maintain the quality of your oral health. Contact our office today. Restorative dentistry can help to repair your decayed or damaged teeth and replace your missing teeth. Tooth restoration can vastly improve the condition of your teeth and the appearance of your smile. We offer quality restorative dentistry. Contact us today. Our office offers many services, including cosmetic contouring and reshaping. Many of our patients take advantage of our endontic and periodontal treatments. However, the majority of our patients come to us to have their teeth maintained and to be assured that their smiles are in excellent health. We provide that security, one that gives everyone one less thing to worry about. Call us today to schedule your appointment. For complex cosmetic treatment, we may utilize several disciplines within the field of dentisty to obtain a patient's goals. Remove your old black fillings and restore the tooth to the original anatomy and color. 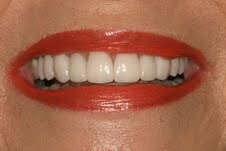 Composite veneers are a less expensive though less durable alternative to porcelain veneers. We have bleached teeth in every conceivable manner. If the teeth are bleachable then we can bleach them. Several different types of crowns are available for different cases. These include all ceramic (no metal) crowns as well as the more conventional porcelain fused to metal type crowns. The most economical and dramatic improvements in cosmetic appeal and oral health can often be accomplished with a new, complete set of dentures or partial dentures. We have prescribed and restored thousands of implants of most brands and size. Porcelain veneers can help give you a smoother, more even smile.